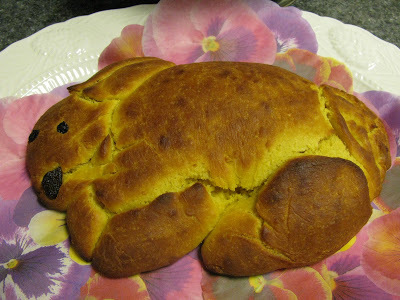 a bunny bread at easter time! 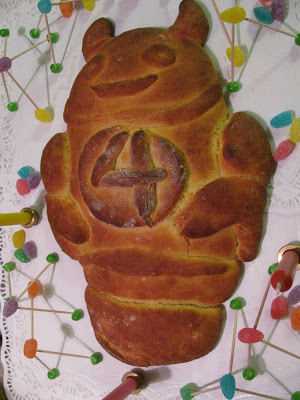 a robot bread for Ollie’s 4th birthday! My good friends know that I am not the most talented cook in the kitchen! but I am trying to be better about that. I suppose I enjoy baking, in that most often one is required to follow a recipe, thus less room for error! Ollie’s school puts out an annual cook book and I decided to share this recipe and while I was at it I decided to post it on Annie’s OMNIUM. 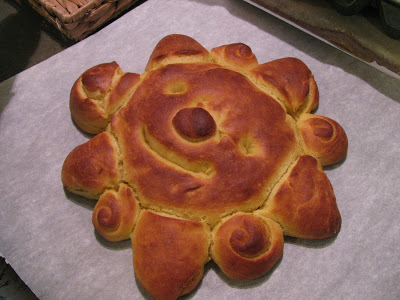 The recipe is taken from Elisa Kleven’s beautifully illustrated children’s book SUN BREAD. I recommend that you buy the book and enjoy it with your little ones and have fun making this bread with them. 3. Add the egg mixture to the flour mixture and beat well. 5. Add the yeast mixture to the batter and stir. Knead dough on greased, floured surface for 8 to 10 minutes. 6. Place dough in greased bowl, cover with a cloth, and let rise in a warm place for about an hour (until doubled in size). 7. Punch down dough, knead for a few minutes, then separate into two portions. 10. Cover the sun and let it rise again in a warm place for about an hour. 12. Enjoy! Your sun bread is delicious plain or with butter, honey, or jam. …again! check out Elisa Kleven’s books… they are all wonderful!